Just to clarify, Miami Nights will also have the windows double shot logo too? If so, that's amazing news! I personally love the look of it with the windows logo, but that's just my personal preference! Really happy both are included (if I'm understanding this correctly). So we might not add an extra 6u spacebar at the time, but we will add the barred 5. All legends including Esc will come textless. While I welcome the barred 5 (and I still hope for that 6u spacebar ), I would like to say that I'm not 100% sure about your decision to modify the modifiers. Look at what's happened with Penumbra: you're considering an addon with lowercase modifiers, because no one loves the caps modifiers. At least you could probably consider the ISO symbology for modifiers? I hate to be negative, but I feel compelled to put my two cents in as I very nearly spent $150+shipping because of what was prominently pictured on the store page is not what I would have received. You're encouraged to take it as a compliment, because if the colorways for the Miami Nights set wasn't so outstanding, I wouldn't have noticed, much less feel incredibly misled and disappointed. I 100% agree with "Sometimes I like to pick some keys from one set, and combine them with another set... having an icon instead of the usual "Control" could probably make the result look ugly..."
I *almost* purchased the Miami Nights kit virtually instantly when I saw the render, but happened to do some more reading on forums where I came across a comment that made me take a closer look. I'm glad I did because I would have been pretty upset if I spent over $150+ on caps that in large part do not look like the prominently displayed high quality render on their store page. I do not understand why a GB would start before the design is finalized. I do not understand why a high quality render was commissioned, and placed prominently on the store page, that in large part, does not represent the finalized layout. I do not understand why a high quality render known to not represent the actual intended layout has been left on the store page for the duration of the GB. I do not understand why it wasn't until 3 days before the GB is scheduled to end that the person running it deigned to impart three scant lines of text and a link to a blurry image of 4 caps to vaguely describe would the finalized set would "look similar to". To me the way this has been run feels at best disrespectful, and at worst, dishonest. I am also troubled because this sort of thing can only hurt the expansion of a niche hobby many people clearly enjoy. Agree completly with nostyle. Realy bad planning changing key's when you are already taking money from the community based on apparently non final renders, why not just run a IC for a couple of weeks before the GB?. Can you please post a complete render of the set or at least how al all the modifiers will look. Very disappointed with this. 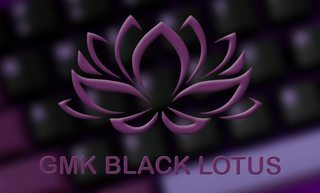 I much prefer the look of the classic symbol + text GMK legends that was given in the render. This makes mixing and matching with other GMK sets difficult. So you're on him because he's trying to modify in regards to feedback during the GB? He could easily not try to take feedback at this time. It just bugs me that a line about him being disrespectful or dishonest would even be posted, especially as you can easily withdraw at this point with no hard feelings. How you say things is just as much of an issue as what you're saying. It appears to me that Sherryton is trying to shorten the time lag between initial concept to final delivery, and I for one, appreciate that effort. The store page shows images that don't match what participants will be receiving without any kind of notice or disclaimer to this effect. The group buy disclaimer only mentions that the product hasn't been manufactured yet so there may be unforeseen delays. I don't believe for a second there's any deliberate attempt at misinformation here (particularly since all the changes make sense), but the page is definitely misleading. Personally, I like all the changes. So you're on him because he's trying to modify in regards to feedback during the GB? He could easily not try to take feedback at this time. My distinct impression has been the feed back and alteration stage is in large part, the purpose of the interest checks. It just bugs me that a line about him being disrespectful or dishonest would even be posted, especially as you can easily withdraw at this point with no hard feelings. How you say things is just as much of an issue as what you're saying. Words absolutely are important. That is why I chose mine carefully. There is no mention on the store page of the possibility of changes, there isn't even a link to or any indication of the existence off a discussion thread. The only reason I came upon it was an offhand comment someone made about whats been going on with the Miami Nights set in an interest check for another GB, I was curious as I intended to buy it, so I went hunting. Disrespectful at best and dishonest at worst? Absolutely. Willfully so? That is not for me to say, but it doesn't matter, the result is the same. If I conducted myself in my professional setting in this way I would not only be out of work, I would be sued, and lose the case. It appears to me that Sherryton is trying to shorten the time lag between initial concept to final delivery, and I for one, appreciate that effort. I applaud the effort to trim the lag between conceptualization and delivery. I abhor this execution. There is an enormous amount of room to do exactly what the GB organizer has done, and still inform prospective buyers what they are getting into. The attempts to inform buyers in this thread, imho, have been halfhearted at best, and that is being generous. To me, to conduct a transaction in this way shows a complete lack of respect of the people spending money. I doubt it's a deliberate attempt to misinform on the part of the GB leader, but I say this not knowing the financials between the store and the leader. Again, I do not know the financials, but to me this GB smacks of an overeager attempt by one party or another to make a quick buck, enabled sadly by the good will of inexperienced apologist enthusiasts of the hobby. That's the way it's done in many cases. But just because that's the way it has been done, doesn't mean that's the way it must be done. Innovation is regularly applied to technology, but where it really comes to the fore is in processes, and I'm glad to see people trying to update those processes in GBs. And one of the driving factors is in trust, and the erosion of such in the hobby because of people doing things the way that they've always been done, and it not working. I'd have to disagree that those words were chosen carefully, but rather out of feelings based on your own approach to the GB. If anyone has been a part of the GB and has any doubts or bad feelings about it or the changes, they can withdraw. That shows no disrespect or dishonest actions. Are there improvements that could be made to the process. Most definitely. Should this be critiqued and the feedback given? Most definitely, again. But to characterize it as disrespectful or dishonest when he's been proven to be otherwise in many buys is pretty off base to me. As far as the financials between the GB runner and the store- that shows that the research done into what is going on has been spurious, as OCo is Sherryton and his fiance. I think they brought one other person on, but not sure if they're still there. So almost every item you see on OCo is a buy that he's done himself in one way or the other. Hey guys, thanks for all the feedback. We're planning to stick to the render, but we'll update the textless above the arrow keys to text: 'Delete', 'End', 'Pg Dn', and 'Pg Up'. I hope this will help! I just want to let everyone know the reason why we tried to change what was shown was because not all the words were textless. 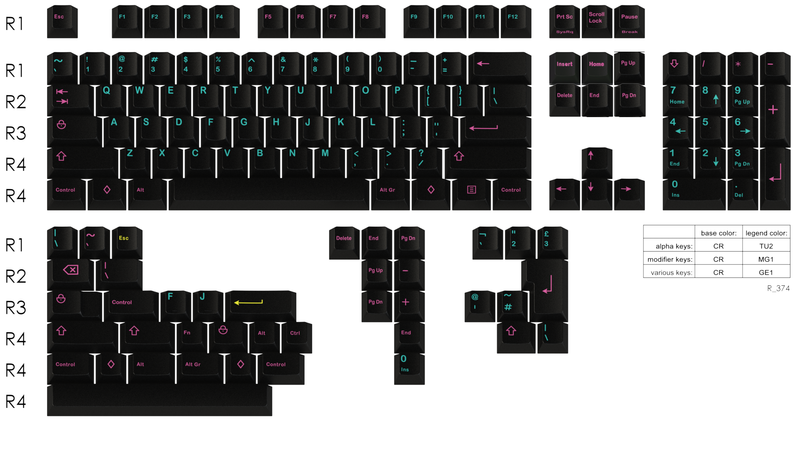 GMK also brought me that template, and I just wanted to see your opinions on it before we went into full effect. Anyhow, I'll be putting in the order this week with the text above the arrow keys. What are the numbers at on both sets? Damn, expected more for Miami! If it doesn't hit 100 are you going to drop it? Yeah, Miami will most likely not make it this time, but I do plan to run it again! I just want you to come back and take a road trip... again! I may have to just convince you guys to come road trip to Canada! If miami does not make it can we switch to the dark set at the same price ? So is this an accurate rendition of the final layout of the set? What we should do, is to choose some legends, that will be consistently similar in all the future group buys. Damn, I liked the full icons set. I should have spoken sooner. If you are planning to stick to the render, does that mean that the diamonds are still in, or will it be Win logo keys anyway? Yeah, that should be correct. We'll be using the Diamond. I hope that Miami will see a rush of last-minute orders. Hey guys, we might open up the Miami set for another 2 weeks. A lot of people are helping fund it today. I think we can reach the MOQ with another week. We will submit the order next week, but leave it open for 2 weeks (June 9th, 2017). Is Miami Nights still follow on schedule? Good news! Realy hope that this makes it. I love this colourway and need a better set than Tai-Hao. How many more until MOQ is met? Why no palm trees and flamingos for the nonalphanumeric keys? Crossed this one off my list, next is GMK Hyperfuse! Thank you EVERYONE for the support. Both sets should be good to go, and we'll submit the order this week! awesome to hear, will be good to finally have a Miami set. Looks like there's an error on the render, as F1 and F2 have magenta legends, when they should be cyan? I really want it.. but do I really wanna spend $150 just to put it on a 60% that i'll never ever use and take 1 ****ty picture of? Jesus...with no regards for human life. Anyway, I'm in for nights at the last miinute. haha, some people who bought Ivan probably bought this too. I have to make an announcement. Because we are quite busy with the event in Taiwan this week, I haven't placed the order yet. We will surely work with GMK to place the order, but they aren't free for another week. The item should still be on schedule, and I'll make more updates if necessary. I have to make an announcement. Because we are quite busy with the event in Taiwan this week, I haven't placed the order yet. 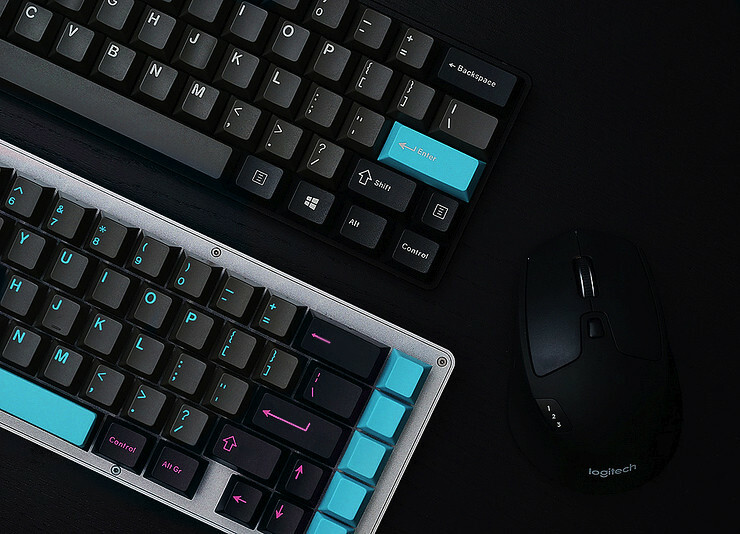 We will surely work with GMK to place the order, but they aren't free for another week. The date should still be good, but I'll make some more updates if necessary. Free sets for Halvy? Great announcement! It's showing 180$ on my end. Did I miss the group buy or is this the original price? I plan on mixing Miami Nights with Ocean Dolch to make Ocean Drive Miami Beach. Sky Dolch/Dolch Reborn Alphas can be a little hard to read (for me) depending on the lighting situation, so I think this level of contrast could work very nicely. Have oco started shipping the Miami sets? Hopefully either arrived at oco or on the way to us by now? 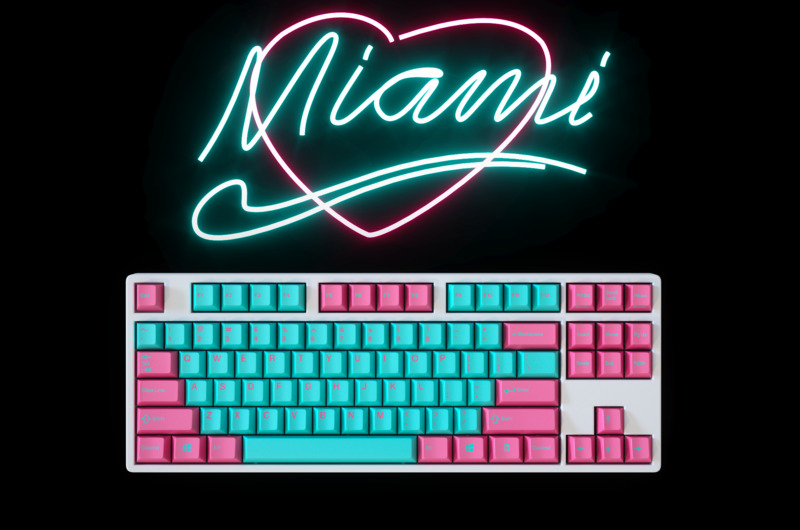 will GMK Miami nights be in there store? It’s in the store now lol. 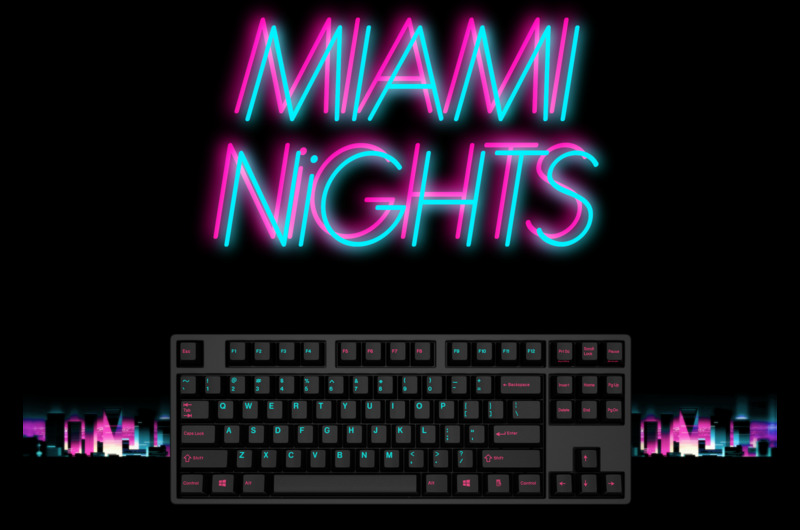 Miami and Miami nights are a single item in the store. You choose which one in the dropdown. I just ordered this set from the website. I am super excited its the final touch to my first keyboard build. I am really glad this set was up for grabs. "crosses fingers" hopefully if it ships tommrow "Monday" I will have it before the end of the week and can get photos of it up before the weekend. I am super super excited. 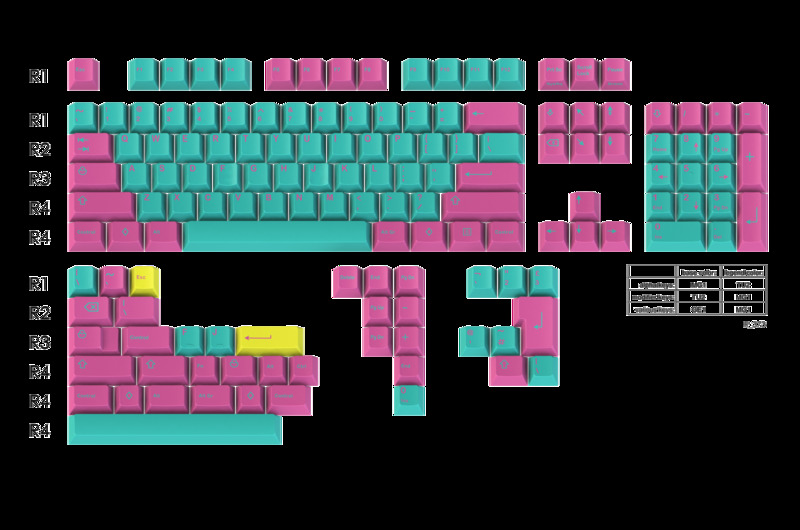 This keyset is going to look steller and its my first GMK key set. I was looking at the SA profile version of this set but cherry is so much better. Noticed that the set is already on the website. I received a tracking number for my GB order about 4 days ago and it hasn't moved forward from pre-shipment state. Are the sets already being shipped out? Would appreciate your update. Thanks. Yes the are shipping. I expect my order today or tomorrow to arrive. Page created in 0.226 seconds with 145 queries.